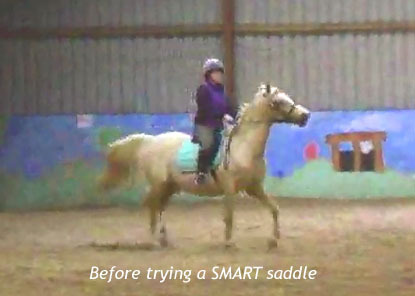 After continuously struggling with saddles, both my friend and my instructor mentioned trying a SMART Saddle from Solution Saddles, as they thought that they make a difference to my horse. Prior to getting in contact with Solution Saddles, I bought a saddle from my local saddler which, although looked like it fit, was causing damage and making him intermittently lame. My part-bred Arab, Sir Nunn Golden Jewel, has always been hard work and like many owners, I put it down to various reasons such as the time of year etc. but looking back, his saddle was the problem. 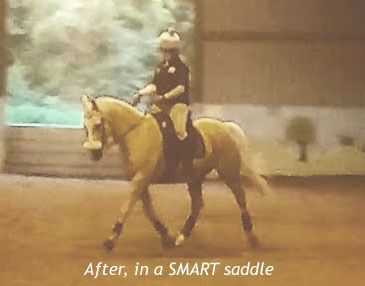 Within minutes of trialling a SMART PRO Dressage saddle he was already moving better, not ‘chucking’ his head around and moving more into the contact. Within half an hour I could feel him stretching his back and swinging through! Since purchasing my SMART saddle, we have gone from strength to strength; his back is changing shape from using the correct muscles, it is soft and supple and he has been continuously willing. We have really put our saddle to the test with long slow hacks, fast hill work, schooling, lessons and competitions. I could not be more pleased and i’m looking forwards to beginning our three year old Andalucian’s career with this saddle, with him only knowing the best. I'd recommend these saddles to anyone!